Astronomers studying data from the National Science Foundation's Very Long Baseline Array (VLBA) and other telescopes have concluded that a binary pair of stars forming an energetic microquasar was blasted out of the cluster in which it was born by a supernova explosion some 1.7 million years ago. This is the first time that a fast-moving stellar pair has been tracked back to a specific star cluster. of the cluster (yellow) in visible-light image. 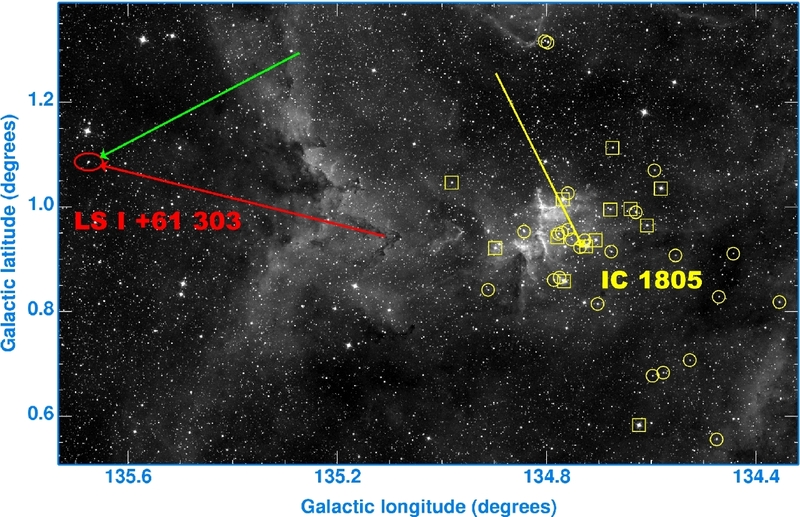 and yellow arrow indicates star cluster's motion. The scientists analyzed numerous observations of a microquasar called LSI +61 303, and concluded that it is moving away from a star cluster named IC 1805 at nearly 17 miles per second. A microquasar is a pair of stars, one of which is either a dense neutron star or a black hole, in which material sucked from a "normal" star forms a rapidly-rotating disk around the denser object. The disk becomes so hot it emits X-rays, and also spits out "jets" of subatomic particles at nearly the speed of light. "In this case, both the microquasar and the star cluster are about 7,500 light-years from Earth and the characteristics of the 'normal' star in the microquasar match those of the other stars in the cluster, so we feel confident that the microquasar was shot out from a birthplace in this cluster," said Felix Mirabel, an astrophysicist at the Institute for Astronomy and Space Physics of Argentina and French Atomic Energy Commission. Mirabel worked with Irapuan Rodrigues, of the Federal University of Rio Grande do Sul, Brazil, and Qingzhong Liu of the Purple Mountain Observatory in Nanjing, China. The astronomers reported their results in the August 1 issue of the scientific journal Astronomy & Astrophysics. Many neutron stars have been found to be moving rapidly through the sky, leading scientists to conclude that the supernova explosions that produced them were asymmetric, giving a "kick" to the star. 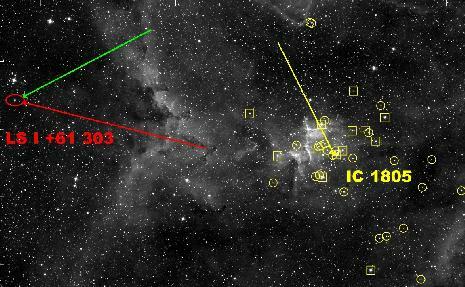 LSI +61 303's motion has carried it about 130 light-years from the cluster IC 1805. The cluster is in the constellation Cassiopeia. LSI +61 303 contains, the astronomers say, either a black hole or a neutron star with twice the mass of the Sun, orbiting a normal star 14 times more massive than the Sun every 26.5 days. The supernova explosion that produced the black hole or neutron star blew away about twice the mass of the Sun. The black hole or neutron star originally was much more massive than its companion. The scientists still are unsure about how massive it was. Some evidence, they say, indicates that it was formed only four or five million years ago and exploded a million or so years ago. In that case, the star would have been 60 or more times more massive than the Sun, and would have expelled some 90 percent of its initial mass before the supernova explosion. On the other hand, they say, the star may have formed some 10 million years ago, in which case it would have been 15-20 times more massive than the Sun. "Studying this system and hopefully others like it that may be found will help us to understand both the evolution of stars before they explode as supernovae and the physics of the supernova explosions themselves," Mirabel said.